We were very pleased that Professor Paul Murdin was able to make our May meeting as he had to dash off to London immediately afterwards for an appearance on ‘In Our Time’ the following morning on BBC’s Radio 4. Paul is a senior fellow at the Institute of Astronomy in Cambridge and visiting Professor at Liverpool John Moore’s University. He is Editor of the Encyclopaedia of Astronomy and Astrophysics as well as a prolific book author. He gave us the opportunity to hear about his latest book ‘Secrets of the Universe – How We Discovered the Cosmos’. 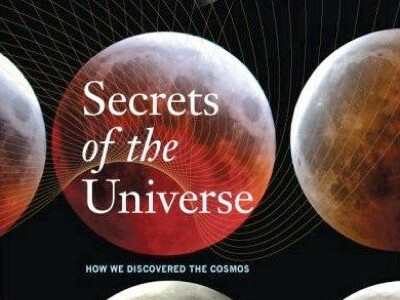 The theme of the book is scientific discovery in its various forms as related to astronomy and cosmology. Seventy case histories have been covered in the book and Paul recounted a selection of these, ranging from the first telescopes to computer simulations of galaxy clusters. Discovery can happen when an unusual observation is picked up and explored further, rather than discarded. As Paul pointed out, the great science fiction writer Isaac Asimov wrote that “The most exciting phrase to hear in science, the one that heralds new discoveries, is not ‘Eureka!’, but ‘That’s funny…’”. Some of these moments in astronomical history include the observation of planets by Galileo, in which the phases of Venus and the moons of Jupiter implied that the Earth goes round the Sun and not vice versa. Jumping several centuries, Paul described how chance observations of radio pulses led to the discovery of neutron stars in the 1960s. Moving back again in time, he recounted the classic stories of the discoveries of Uranus by William Herschel and Neptune by LeVerrier and Adams. Although both involved planetary discovery, they were quite distinct in that the existence of Neptune was predicted purely from theoretical calculations, an astonishing achievement! While the background to these older discoveries is fairly well known, that relating to more modern advances in cosmology and planetary science are less so, like the volcano on Io. The Voyager 1 mission imaged this moon of Jupiter in 1979. Linda Morabito was an engineer on the mission and wanted to examine the images in more detail for navigational purposes. She increased the gain on the images and noticed a plume of material on one side of the disc. Subsequent investigations showed that it was an active volcano, one of what is now known to be around 700 such features on a moon that is subject to huge stresses from Jupiter’s gravitational field. This was another neat example of serendipitous discovery brought about by the “prepared mind favoured by chance” to paraphrase Louis Pasteur. All in all, this was a most thought provoking and enjoyable talk that prompted many questions for Paul, and much discussion over coffee and biscuits afterwards! Paul’s book, published by Thames and Hudson, retails at £24.95 and is available from all good bookshops. Paul’s book is actually available on Amazon for under £15 – an absolute bargain! Click the link at the end of the first paragraph…..